Teens need to know that they can take charge of their well-being, speak up if they start to notice problems, and support others respectfully. Many mental illnesses start during the teen years, yet many teens don’t receive the help they need right away. It doesn’t have to be that way. Working towards good mental health and seeking help early means that teens can get back on their feet more quickly when problems arise. We know that teens want open lines of communication with their parents. Teens who are connected to caring adults they can turn to tend to feel better and do better. You don’t need to have all the answers. You just need to be open, curious, and compassionate. When should I talk to my teen? Make mental health an ongoing topic of conversation. Be there and be interested whenever your teen wants to talk, and don’t be afraid to ask questions to get the conversation started. You can also bring up mental health whenever you notice that your teen is going through a stressful period or is expressing a lot of negative thoughts about themselves or the situation. Here are key messages to share with teens. The more you model them yourself, the more effective they will be. We all have mental health. Mental health is an important part of everyone’s health. When you have good mental health, you can cope better with stress. When you have poor mental health, you might have a harder time feeling good about yourself. Mental health changes just like physical health can, so don’t ignore problems. Even if you are diagnosed with a mental illness, mental illnesses are treatable. Bad days are part of being human. Everyone will have a bad day, or even a bad week, at times. It’s normal to feel low, stressed, or anxious when we experience conflict, disappointment, loss, or other upsetting situations. The key is that the feelings should match the situation and you should start to feel better as things improve. For example, if you feel anxious about a school project, the feelings should go away when the project is finished. Speak up if you’re having problems. If you’re concerned about your mental health, speak up and ask for help. That way, you can manage problems before they become harder to treat or have a bigger impact on your life. If you don’t feel comfortable talking with parents or caregivers, talk to a counsellor or teacher at school, or any other adult you trust. Mental illnesses aren’t always shown very realistically or respectfully on social media, in movies, or even in the news. Most people with mental illnesses are trying to go about their lives as best they can. Remember that everyone deserves equal respect. If anyone talks about suicide or ending their life, take it seriously. Call your local crisis line, the national Kids Help Phone at 1-800-668-6868, or text 686868, there is also the First Nations and Inuit Hope for Wellness Help Line at 1-855-242-3310. If you think that someone’s life is in immediate danger, call 911 or go to an emergency department. Take their concerns seriously. It might be easy to dismiss a teenager’s concerns as ‘just hormones’ or ‘just another part of growing up,’ but that isn’t helpful. Even if you can’t relate to the problem, you can still express concerns about your teen’s worry or distress. Take time to listen—without judgment. If you’re in the middle of something else, find a time later in the day when you can talk and give your full attention. Don’t judge what you hear. Just listen and be there. Ask your teen what they need. They might already have a good idea of the next steps they’d like to take. Don’t worry about having all the answers right away. This can be an opportunity to learn together. Offer alternatives. It can be difficult for some teens to talk with their parents about some subjects. Give additional places to seek support, such as a school counsellor, another family member, a local mental health or youth organization, a website, or a phone line. Talk about safe situations to share personal details. It’s very hard to take information back once it’s posted on social media or shared with others, so encourage your teen to think about safe places to talk and seek support. Seek outside help if you need to. Your family doctor is a great place to start. They may be able to assess problems and provide treatment. They will also refer your teen to specialized mental health services, if needed. Your teen’s school counsellors can also help. They can offer supports at school, and they can refer your teen to resources in the community. Contact Foundry Kelowna. 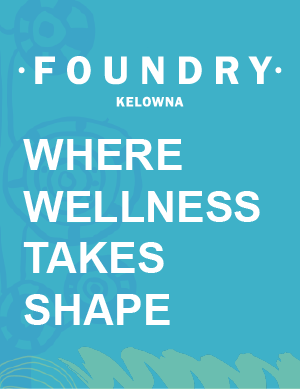 Foundry Kelowna is an integrated youth and family clinic that unites partner organizations to provide coordinated services addressing the primary care, mental health, substance use, counselling and social service needs of youth aged 12 – 24 and their families. Foundry Kelowna supports young peoples’ wellbeing by intervening early so youth can find the help they need, when they need it. The Canadian Mental Health Association, Kelowna and District Branch is the lead agency and operator of Foundry Kelowna, 100 – 1815 Kirshner Road 236-420-2803.